Sul sito Foodiamo.com si parla del nostro Brachetto d’Acqui! The Braida winery is named after founder Giuseppe Bologna’s nickname, great-grandfather of the current owner. 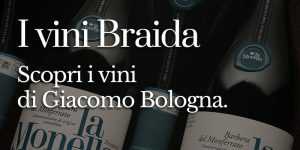 Famous all over Italy – and the world – for their excellent Barbera, Braida winery preserves the uniqueness of other native varieties, too: Moscato, Grignolino and, you guessed it, Brachetto! Their Brachetto d’Acqui, as tradition dictates, is a sparkling red dessert wine that is obtained with a brief re-fermentation in a pressurized container (autoclave). It has a ruby red color with a purple hue, with a strong aroma of berries. On the palate, it’s smooth, fresh, and sweet. Ideally, it should be paired with typical Piedmontese cookies (ever heard of baci di dama? Yum). Or chocolate, like the Recioto from Veneto that I presented a while back. Or even a juicy fruit salad, if you feel like experimenting a bit. Brachetto d’Acqui Braida is a wonderful example of sweetness obtained in the most natural way. Unlike many wines, widely available in stores, that contain tons of added sugar. If you pay attention to the hint of berries, you’ll be able to notice the difference.